I now own three of these. 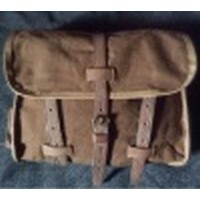 I need them to keep my M1910 and M1928 Haversacks together. I minimize my storage space for field equipment by packing and rolling the proper items into assembled field packs. I also have M-43, Jungle Pack, and Mountain Rucksack that use T-Handle Shovels. Unfortunately, I needed another painted T-Handle Shovel and you were out of them. The unpainted will, however, suffice. I will just use some Krylon dark green camouflage spray paint. Thanks, Major, for keeping up the stock of all of your items. The size of your inventory simply boggles the mind. Some day when I make it to Salinas (I don't think I will be going to Dubai anytime soon) I am going to call you up and ask for a tour. Nice e-tool, well made, great price, fun to hit annoying nagging haters with! No matter how you feel about the quality, try to find an original. It is well made and fills a void in any collection.